The mouse is quite high/big and therefore you have to bend your hand up from the table even more than with smaller mice. So I think unless you have pretty large hands the mouse isn’t very ergonomic after all. This was the reason why I returned it as I found it very uncomfortable to use over a longer period of time. 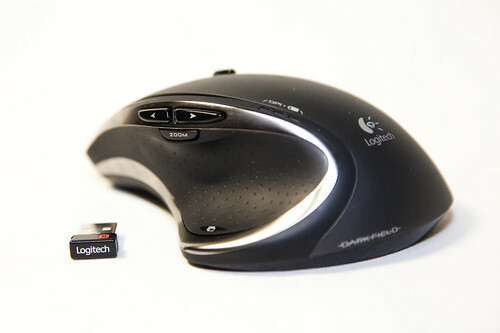 The Logitech Performance Mouse MX is a very good product and I think it is worth the money – but only if you have pretty large hands. With my rather medium sized hands my ball of the thumb (Handballen) was mostly not on the table but on the mouse/in the air which I found very uncomfortable over a longer period of time. Here are a few things I found out during the few days I had the mouse that people who have this mouse may find useful. Set Button 9 (thumb button) to “Dokumentenwechsel” (don’t know how they translate this to English) in the Logitech software. This uses the default Windows document switcher (“Windows” + “Tab”) and not the ugly and slow Logitech version. Also in the Logitech software or in the Windows control panel under “Mouse” set the vertical scrolling to “6 Zeilen” (6 lines). This is important if you are using software like Google’s Picasa because otherwise scrolling won’t work properly in these programs. Notes: For their 2008 album “Side Stepper” the Australian band The Bamboos recorded a cover version of this Kings of Leon song which I heard on FM4 yesterday. It’s such a happy and cheerful tune. I love it. Notes: The Naked and Famous are from New Zeeland and they sound just like many of those Electronic Indie Rock bands today. Just watch the video above and you will know what I mean. Nevertheless I really like this song. By the way: Happy 2011 everybody!